FOODIES are you ready for some Tokidoki goodness?! how does Tommy Yum Yum, Nasi GoGo, Ruby Ramen, Hotty (Chaser! ), Dough Boy (Mini Bao), Mr. Matchamoto, Toki, Punchy, Kim Kimchi and Mei Mei sound? Yum! tokidoki just made going to the grocery store a lot more fun! We’ve brought all your favourite snacks to life in these ten new, mouth-watering characters. 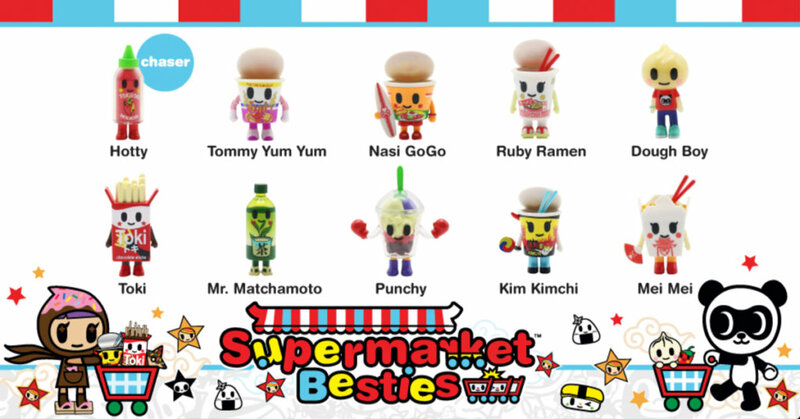 Open up a blind box and satisfy your craving for cuteness with our Supermarket Besties! Tommy Yum Yum – Tom Yum Soup in a cup! Dough Boy – A dumpling! – Features may include transparent details and more! Please Note: These are “blind boxed” items – meaning, you don’t get to choose what assortment of figure(s) you’ll receive. You won’t know which one you’re getting until it arrives. Think of it as a sweet surprise! Please understand that due to the production process, variations may occur from figure to figure. As these are blind boxed items, duplicates may also occur. Ordering 10 blind boxes does not guarantee that you will receive all 10 characters.